I recently made a flying visit to Rioja, to see the stunning new Museum of Wine Culture opened by the Vivanco family next to their winery near the small hilltop town of Briones (you can read my report on the museum here). But while I was there I could not miss the opportunity to visit the winery too. Though established by his father in 1915, Pedro Vivanco is the shrewd businessman and passionate collector who amassed the museum’s historic collection of wine-related artefacts over 40 years. Pedro made his fortune in the wine trade. He was a merchant, became a substantial vineyard owner, and went on to build a portfolio of his own bodegas. 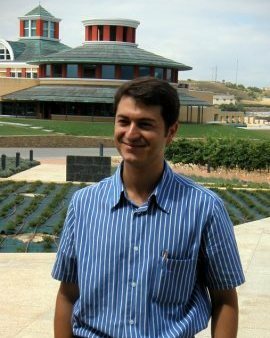 Much of Pedro’s business was done away from the spotlight thrown on the biggest names of Rioja. But quietly and steadily he grew Vivanco into a major player on the Rioja stage. The family owns seven bodegas and some 400 hectares of vineyard, with other wine interests in Navarra. In 1985 Pedro bought the site of the current winery and museum, in the heart of Rioja Alta. In 1990 he started the ambitious project that would become the driving force for himself and sons Rafael and Santiago: the Bodegas Dinastía Vivanco. Rafael is a softly spoken and charming ambassador for Dinastía Vivanco. He is winemaker, trained in Spain and Bordeaux, but with extensive worldwide travel under his belt. Rafael’s brother Santiago works mostly on the commercial side of the business, with his degrees in law and business management. Rafael showed me around their new and beautiful underground cellars that have just been completed next to the existing winery. It soon became clear that the family has huge ambition for Dinastía Vivanco, and is lavishing time, money and passion on improving every aspect of the business. I suspect that ambition is to make Vivanco one of the icon wines of Rioja. 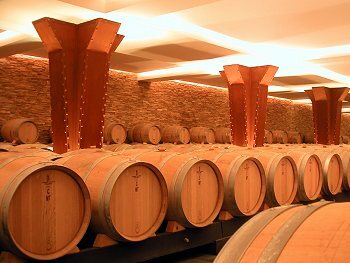 The immaculate winery is built so that grapes and wine are moved by gravity at most stages. The temperature controlled grape receiving bay contains not one, but two sorting tables, were very small crates of grapes are delivered and sorted by hand. 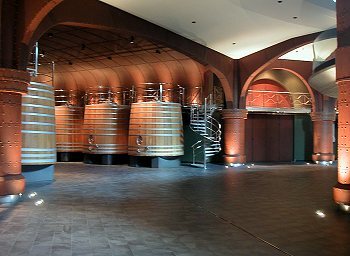 From there they fall down into the winery’s large wooden vats, each of which is computer-controlled, combining the best of traditional and modern technology. Ageing is in a combination of French and American oak; all French for the Reserva bottling. The Vivanco range is still developing, but will include a varietal Graciano, or a blend heavily dominated by Graciano. The Vivanco’s have a soft spot for this variety, and have planted warm sites in the Rioja Baja were they believe it will flourish. As well as tasting the current commercial releases, I tasted four varietal barrel samples from the 2005 vintage. I have to say that these included some really impressive wines, and if the Dinastía Vivanco continues with its approach of investment, quality raw materials and attention to detail, the future vintages from this new Rioja estate will be well worth keeping an eye on. These wines are imported into the UK by Bibendum Wines. A Tempranillo-based blend, this has a very spicy, peppery nose of vanilla and soft red fruits. On the palate there is good freshness to the fruit, with lots of cherry and ripe berry flavours. There’s a real jammy ripeness to the fruit, which along with the sweet oak is just a touch cloying, but grippy, roughening tannins and that charry oak quality do add balance. Very good. £8.99. The nose is laden with sweet, smoky scents of new oak, but it is very fine and classy, with a cedary touch leading on to lovely fruit on the palate: it is quite lean, dry and savoury in style, perhaps packing a little flesh, and showing too much wood at this stage. Seems to have a wonderfully soft, full, tobacco and smoky depth of plush plummy fruit that has really absorbed the oak. On the palate there is lovely concentration and plush depth, with little notes of strawberry and soft, creamy fruit, but there is a wonderful dark, juicy quality. Lovely wine. Quite spicy and dusty on the nose at first, with soft, strawberry fruit coming through, and an overlay of creamy oak with a marzipan edge. On the palate this has really nice, open-knit, generous red and black berry fruits, with lots of tang and ripe, sweet weight, and a drying, smoky, ash-like note in the finish. Extremely dense colour from very low yields. Lots of vanillin and smoky oak, but massive spicy presence, with cedar and cinnamon notes, and lots of rich blackcurrant and berry fruit. The palate has a lot of density and structure, with a savoury, dry, very tannic edge that is quite grippy and chewy, with a certain rusticity but packed with character. Lovely, firm, meaty stuff.